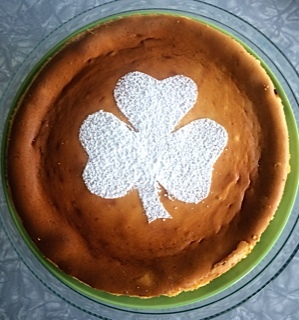 Surprise your friends and family with this gorgeous Bailey’s Irish Cheesecake for Saint Patrick’s Day! This delicious cheesecake pairs perfectly with a strong Irish coffee for an unadulterated indulgence. 1. In a large mixing bowl with a paddle attachment, beat cream cheese and sugar together until smooth. 2. Add eggs one at a time, scrape down sides of bowl after each addition. Then add vanilla, Bailey’s, and heavy cream. Continue to beat until just combined. 3. In a 9-inch spring form pan, gently press shortbread pie crust onto bottom and sides of the pan. 4. Melt chocolate in a bowl placed over a pot of boiling water or in the microwave. Let cool for a few minutes, then gently pour melted chocolate over shortbread crust. 5. Pour cheesecake batter on top of shortbread crust and smooth out. Bake for about 45 minutes to an hour at 350 degrees or until caramel colored and center is firm. 6. Let cool completely on a cooling rack, then refrigerate for at least 4 hours or ideally over night. If desired, decorate top of cheesecake with a powdered sugar shamrock. This entry was posted in Blog and tagged recipes, Shortbread.